Burrata Burrata Burrata! 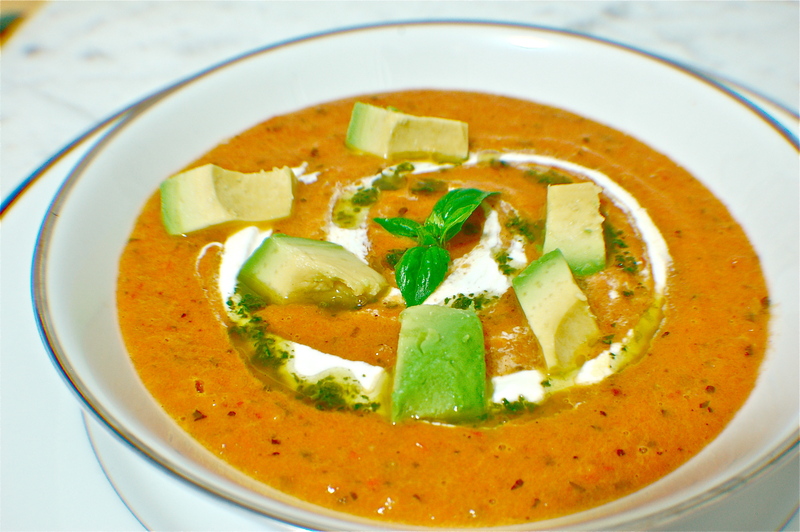 Another delicious food I “can’t” eat on a paleo food plan, but I do it anyway. Because (a) a small bite of anything won’t kill me and (b) I have exactly zero self restraint. I have found out a few things about burrata. First, burrata is actually mozzarella cheese, not a whole different cheese in itself. It is a solid mozzarella on the outside that encases shredded mozzarella mixed with cream. Hello, YUM. Secondly, it’s more common than you think. Even if you live out in the middle of the desert in Washington (my mom does), you can find it at Yoke’s Fresh Market. Third, it is like Lay’s Potato Chips or little black dresses – you can’t have just one. Fourth, you can use it about a zillion ways. I counted. But I settled on showing you three. 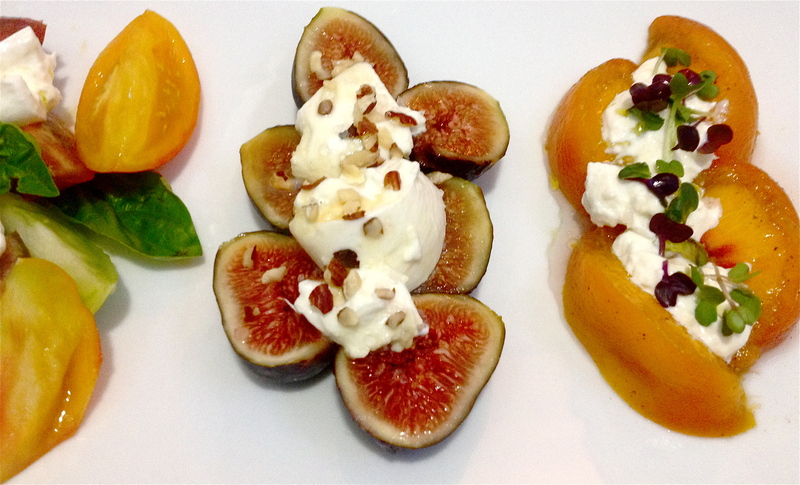 Today’s post is three separate burrata salads that I served as an appetizer. I experimented with using different sections of the burrata (outer later, middle cream section, or both), different mixin’s from traditional to way out there (pickled peaches! 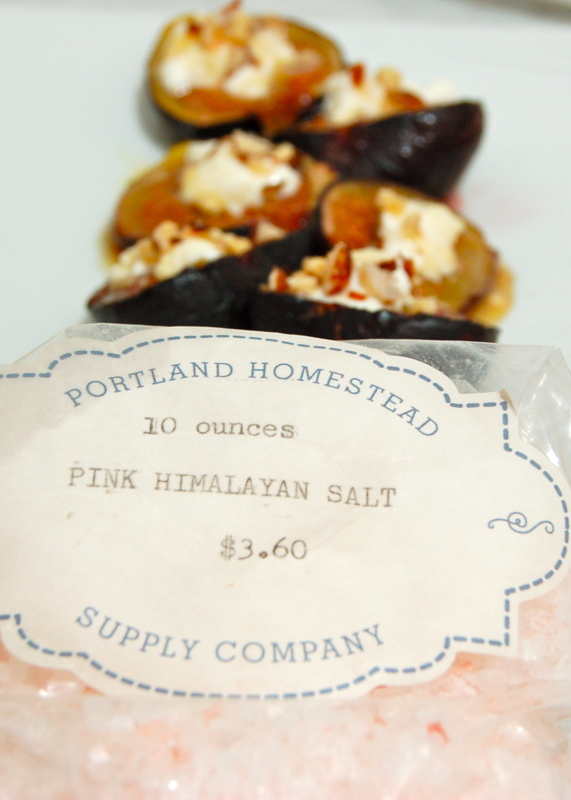 ), and varying salts from my favorite Portland salt shops. 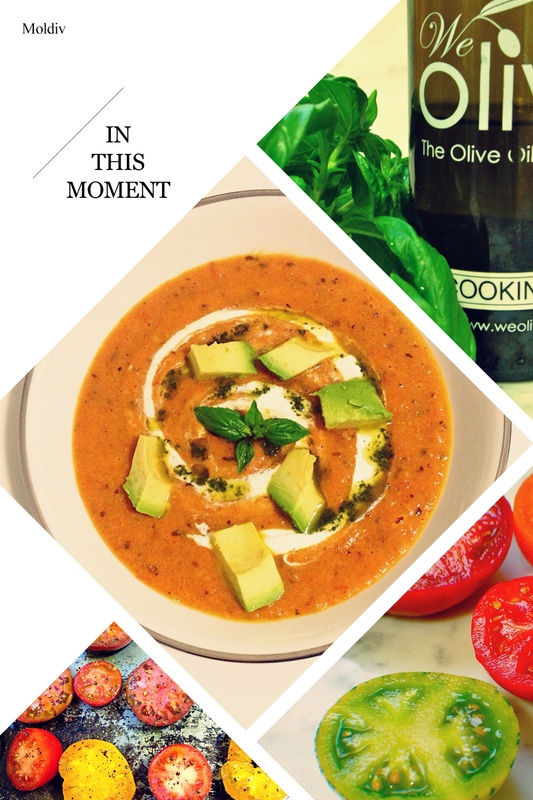 All three are relatively easy and are serious crowd pleasers, so let’s get to cooking, shall we? 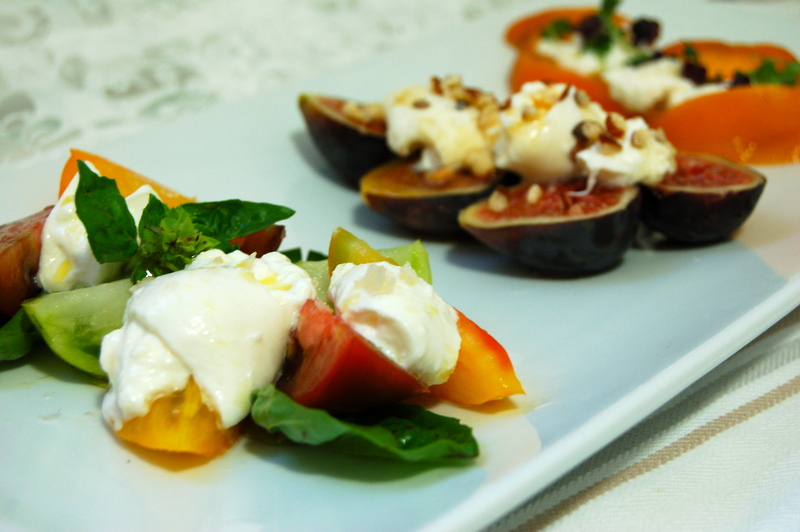 These three burrata salads are sure to be crowd pleasers, inviting everyone to enjoy tasty bites of fresh tomatoes, honeyed figs or sweet & sour pickled peaches. Burrata comes either in a plastic container filled with water & the burrata ball (like mozzarella) or wrapped in a specialty waxy/plastic paper. The easiest way to handle burrata is to take it out of the vehicle it comes in and place in a small bowl. Once you cut into the ball, the creamy mozzarella & cream inside will go everywhere, so it’s best contained somewhere it’s free to go crazy. 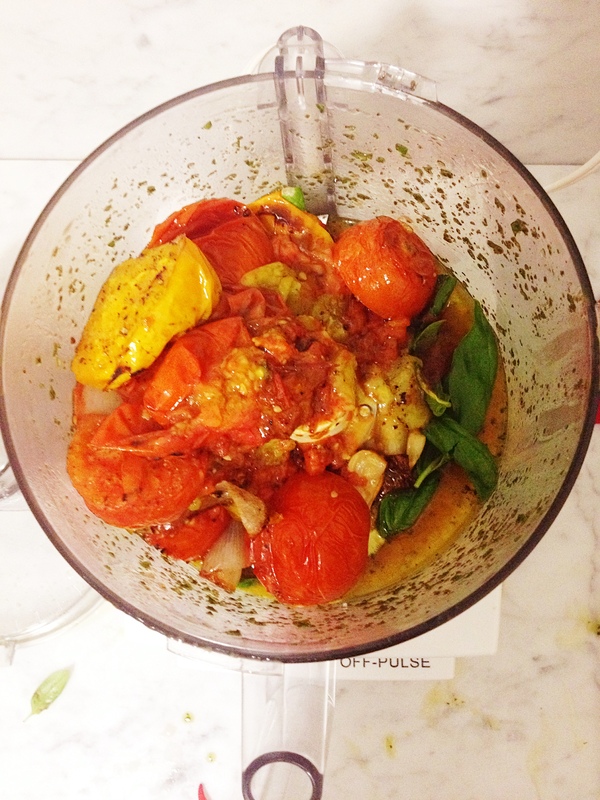 Since there are few ingredients, use the freshest and the ripest. I harp on this constantly because it’s true. 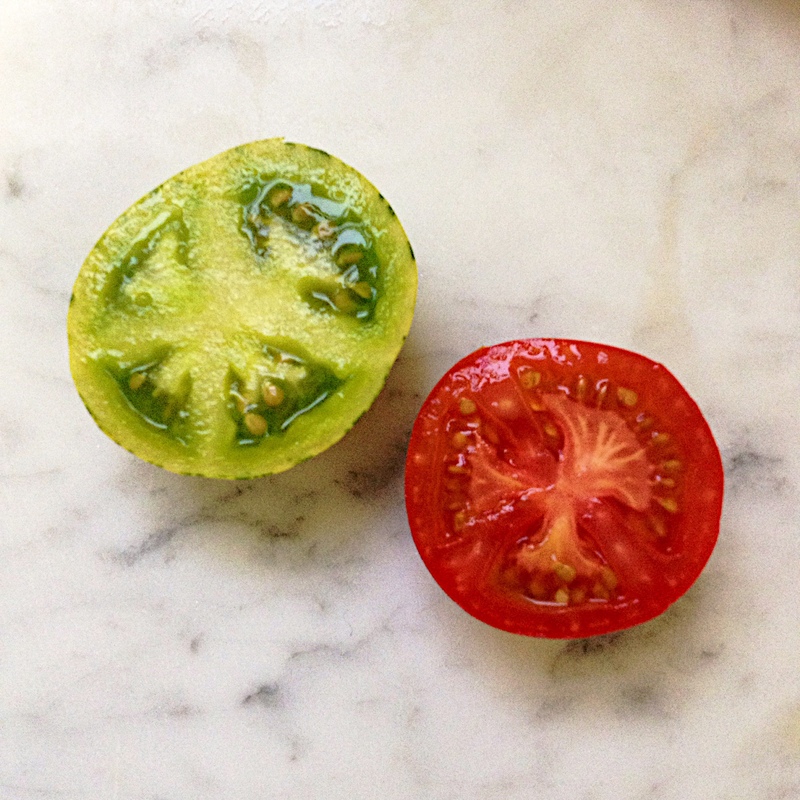 If you use old, mealy tomatoes or under-ripe peaches, the salads just aren’t worth it! I’ve included below three separate recipes, ordered from easiest to “most difficult”, and by “most difficult” I mean there are one to two extra steps. And finally, I’ve included the salts I used on each, all from specialty shops in the Portland area. Of course you can use your own favorite salts, but I have a thing about specialty salt (I own 19 of them currently) and giving props to the amazing shops that sell great ingredients. Wash and dry tomatoes and basil. 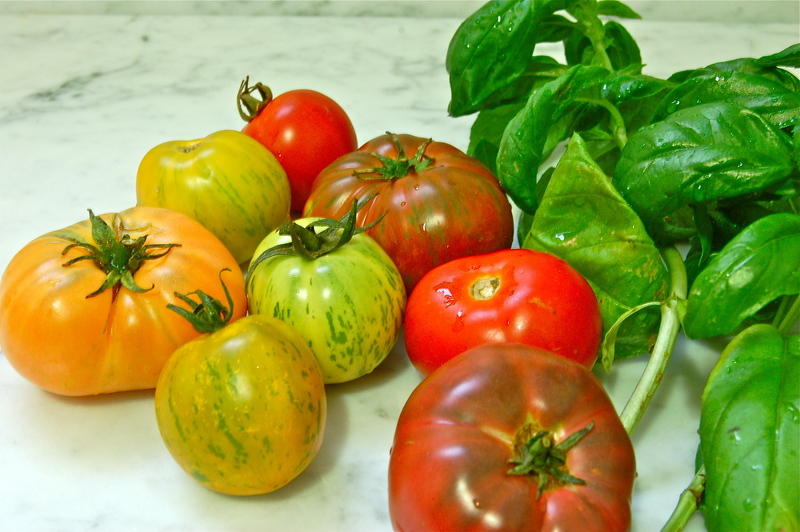 Slice tomatoes and use smaller leaves of basil. Arrange pretty on a plate. Cut off small slices of burrata, using primarily the outer layer of the burrata. 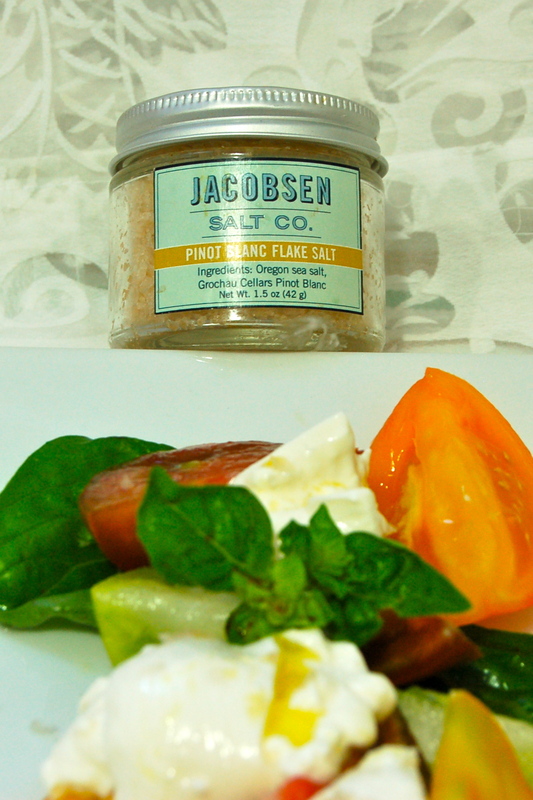 Place on salad and finish with olive oil & Jacobson’s pinot blanc flake salt. Honeyed Fig, Hazelnut & Burrata Salad (roasted version) with Portland Homestead Pink Himalayan Salt. 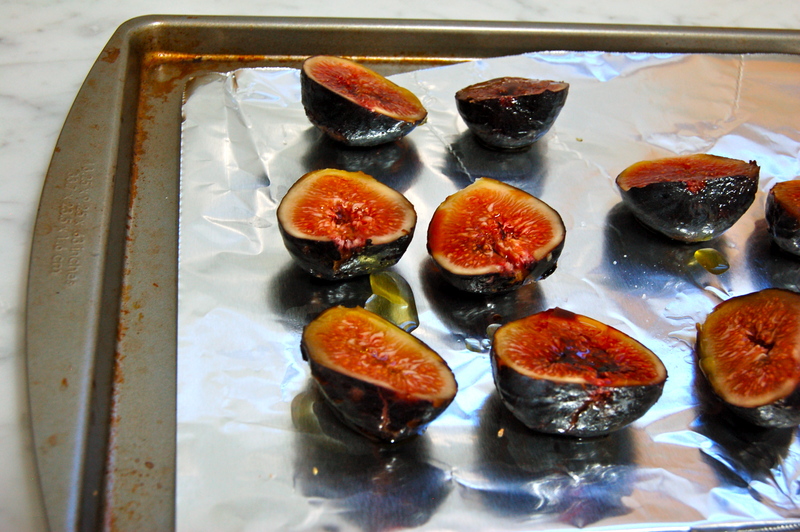 For this recipe, you can either bake the figs with olive oil & balsamic vinegar or leave them fresh. 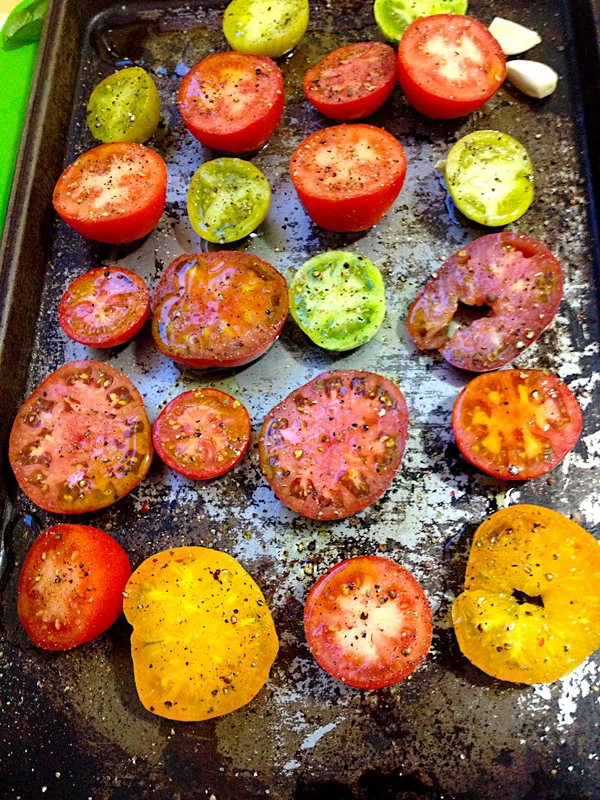 I prefer the fresh version, however the roasted version can provide the heat element to your trio of salads. The recipe below is the roasted version, but just skip the roasty parts if you’d like it fresh. Preheat oven to 400 degrees. Wash & dry figs, cut off the stems, and cut in half. 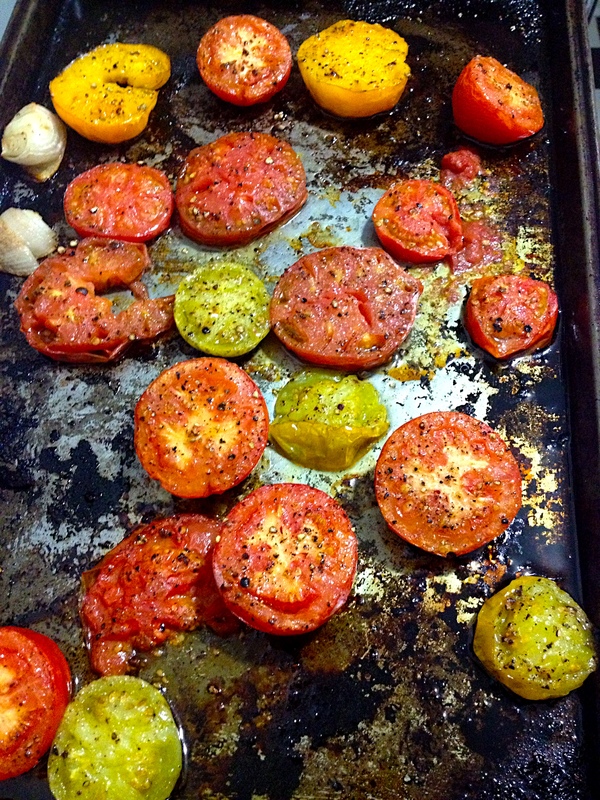 Drizzle with a bit of balsamic vinegar & olive oil. Place on a small pan that’s been covered with aluminum foil. Bake for 10 mn until you can smell the roasty figs, but do not overcook as they will turn to smooshy figs. 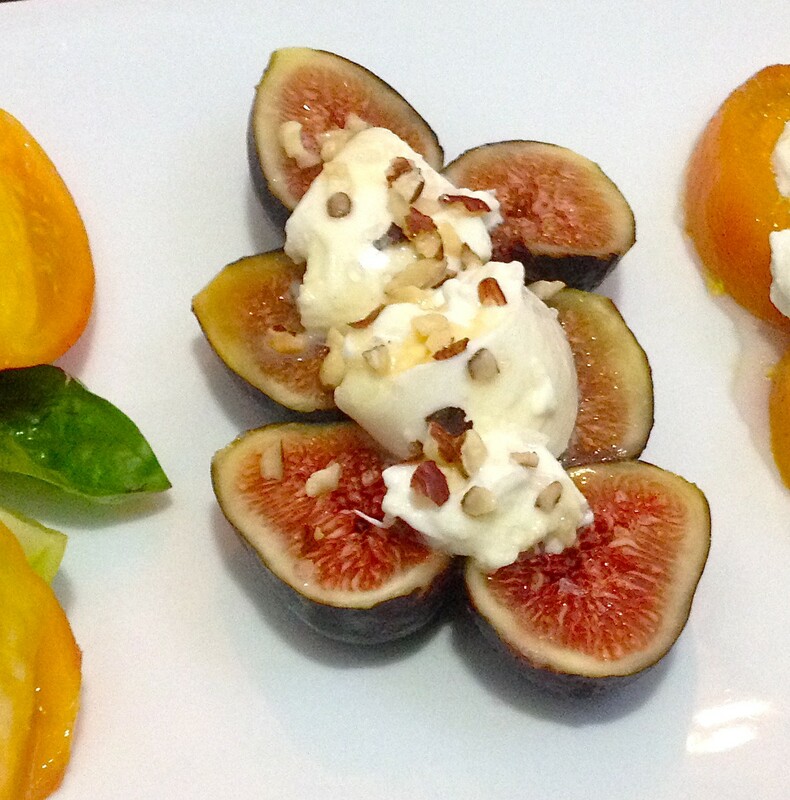 Arrange figs pretty on a plate. Cut off small slices of burrata, making sure to include both the outer and inner layers of the burrata. 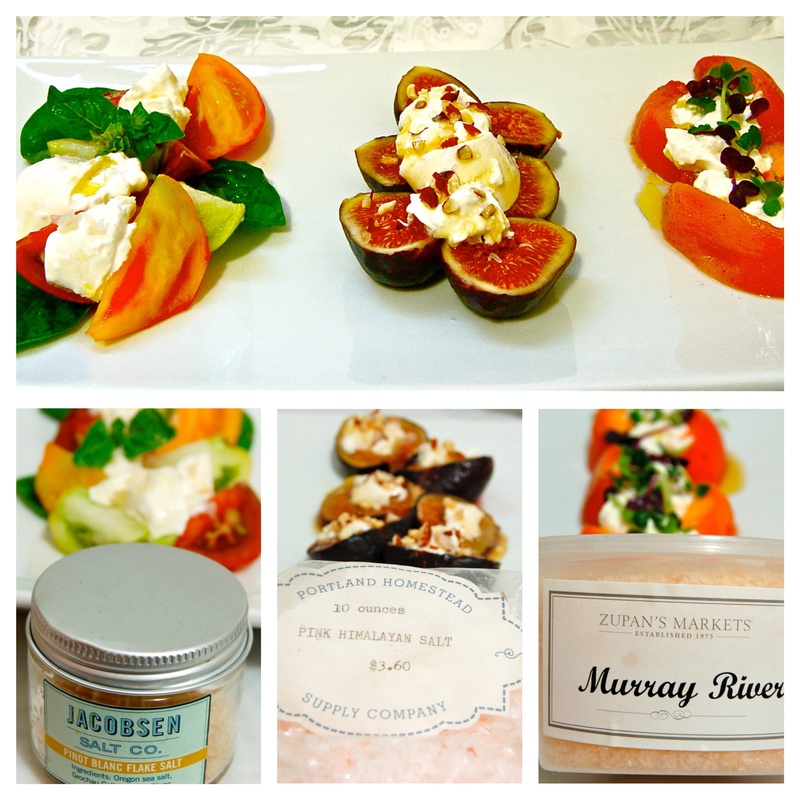 Place on figs and finish with hazelnuts, honey or agave and Portland Homestead Pink Himalayan Salt. Wash and dry peach and micro greens. 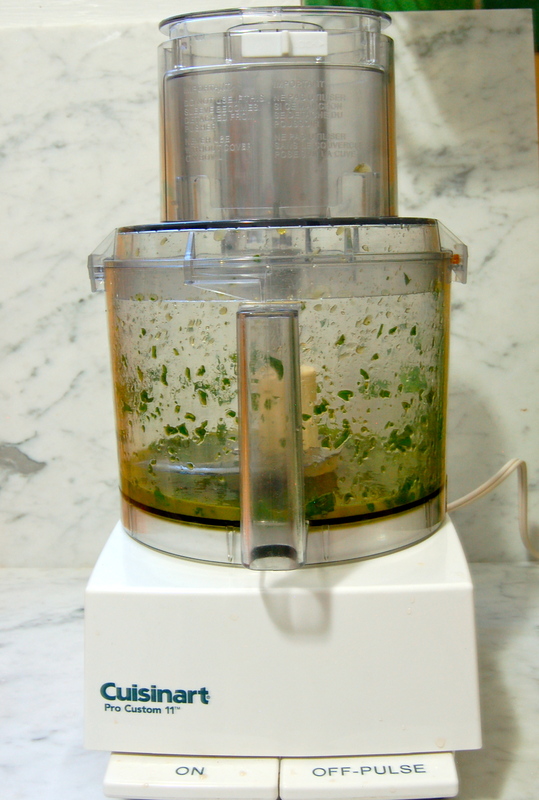 Then, make the pickling sauce. In a small saucepan over medium heat, add vinegars, sugar, water and allspice. Heat until sugar dissolves and set in fridge to cool. Peel the peach. The easiest way to peel is to place a peach in boiling water for about 2 minutes, run under cool water, and the skin will come off easily. Thanks, mom, for teaching me this since you canned about a thousand points of peaches in your life. Slice peach and let pickle in the pickling sauce for about 10 minutes. Do NOT over-pickle. 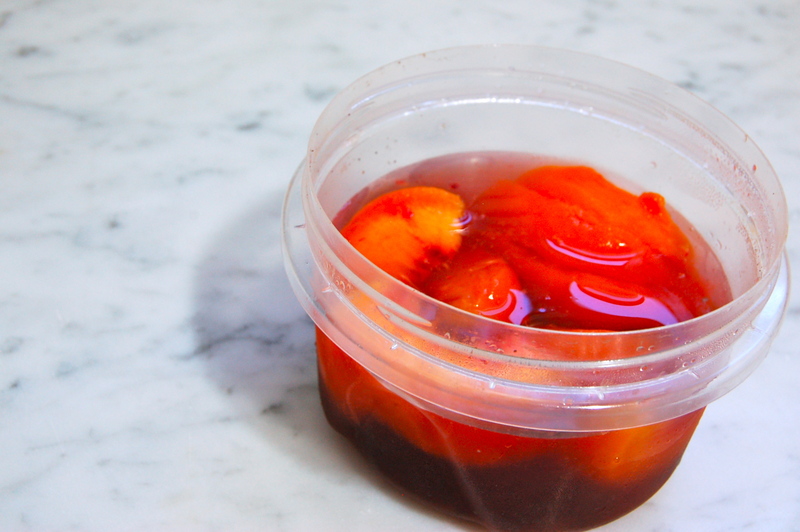 Vinegar is a tenderizer and will turn your peaches to smoosh if you leave for more than 30 minutes. Drain peaches and arrange pretty on a plate. Cut into the burrata and pull out the creamy insides of the burrata. Drizzle over peaches. 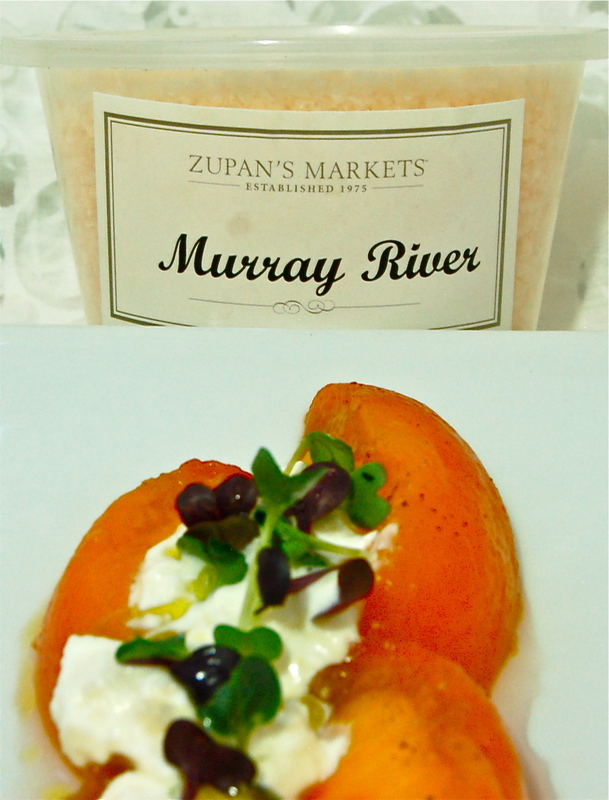 Finish with micro greens, olive oil and Zupan’s Murray River Salt. And there you have it…three perfectly balanced and delicious burrata salads. Now go forth and impress your friends with these three easy and yummy salads and good luck – remember, you can’t have just one!